If you were to go to Australia and get a craving for food from Burger King, you’ll have to go to a fast food chain called “Hungry Jack’s”. 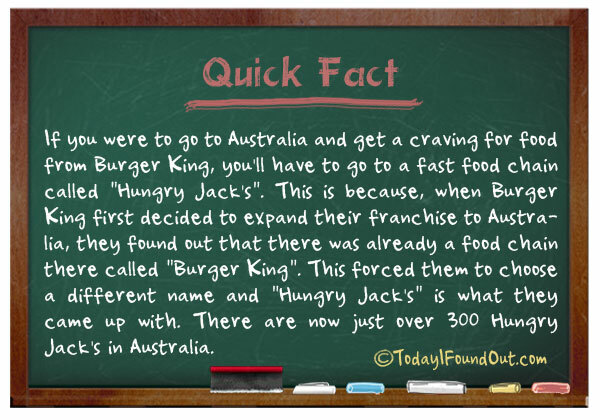 This is because, when Burger King first decided to expand their franchise to Australia, they found out that there was already a food chain there called “Burger King”. This forced them to choose a different name and “Hungry Jack’s” is what they came up with. There are now just over 300 Hungry Jack’s in Australia. It wasn’t another chain, it was just one shop in Adelaide, South Australia. Nonetheless the name was still already trademarked.